Just recently redid my home page, with some favorite photos. Of course there's a story behind every photo. 1) I had recently arrived at a book retreat weekend in Santa Cruz, California, and one of the authors was snapping photos. I was a bit wary as I had barely met this author, and it shows. Which is one of the reasons I love this picture. I've since found out that Adam Johnson has a wonderful eye for impromptu portraits. 2) Another book retreat weekend, this one in Boulder! I was with my dear friend, the writer David Slayton, when we ran into Peter Heller, one of the featured authors, and asked him to eat with us. 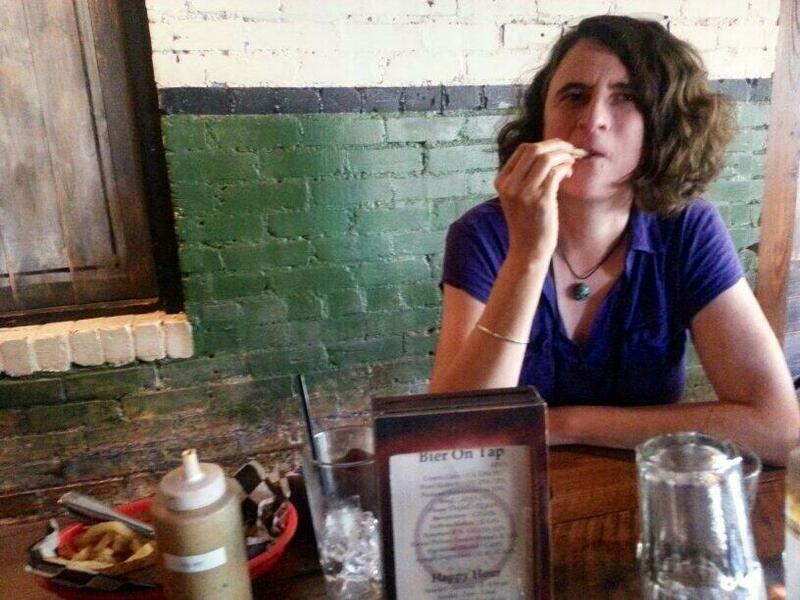 This is me, stealing one of Peter Heller's french fries. (I did confess.) Photo by David. 3) My friend Ben LeRoy, who's also a publisher, decided in 2014 to spend one day volunteering in every state. He happened to come into Nashville while I was there visiting, and our mutual friend Zack Barnes - a devout reader, writer, and now a middle school teacher - and I hustled to find volunteering opportunities. Ben and I spent the morning at a downtown rescue group, and the afternoon sorting donated clothing for a domestic women's shelter. What an eye-opening day; what two wonderful men. 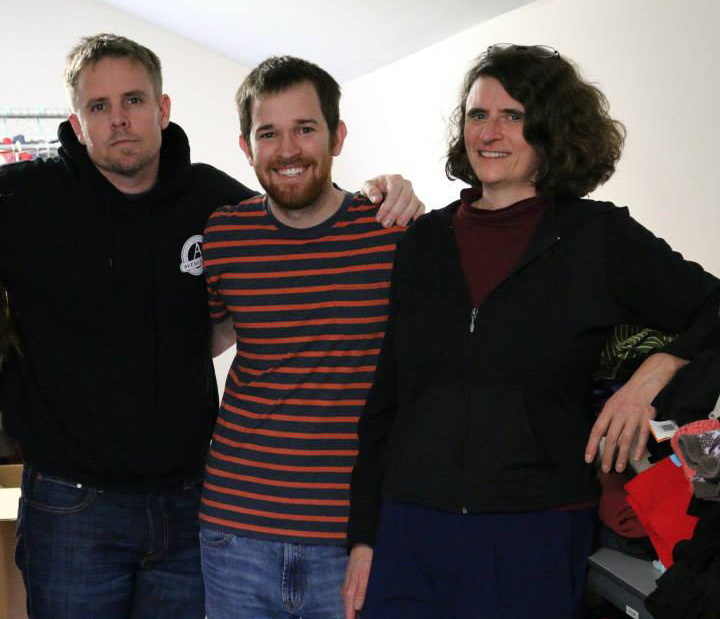 (One of my very favorite fan/author stories is the night Zack came to a Laura Lippman event - before heading for the event his fiancee Anna asked him if the Harry Potter hoodie he was wearing was appropriate. It's fine; it's just Sara, he told her. So of course Laura asked me and Zack out to dinner, at a lovely restaurant ... Zack hasn't dared wear a sweatshirt to an author event since. I think I was too polite to take a photo of his sweatshirt that night. I'm sure this one is Ben's photo, using a timer. 4) Ali Karim is a reader and book blogger from the UK who's also a chemist - he's been my good friend ever since the day that he declared to author Taylor Stevens at a book conference that he was voting for her for the award she was up for ... when I was standing right there, up for the same award! Of course I didn't let him forget it for a long time. Ali is such a good guy, and such a book enthusiast. 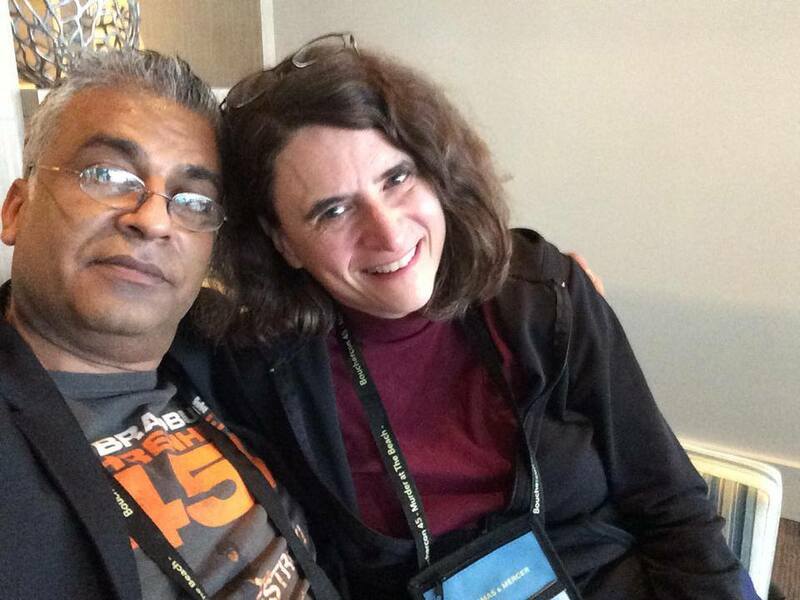 (This was post-event at a book conference - we were both tired.) I'm betting this is a Peter Rozovsky photo. 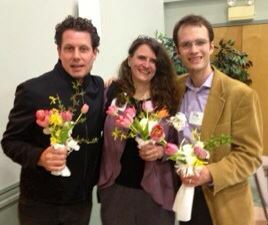 5) This was at the Newburyport Book Festival, just after the dinner - co-organizer Jennifer Entwistle had just urged people to take the flower centerpieces with them, and authors Ethan Gilsdorf and Max Gladstone, and I all grabbed flowers and of course lined up for Jen to take a photo. 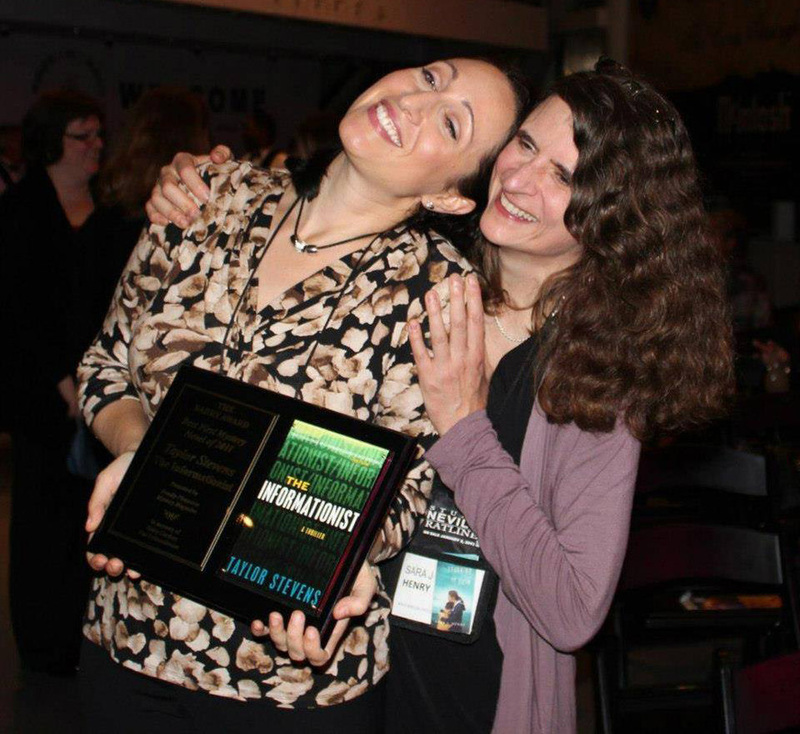 6) And here's me congratulating my friend Taylor Stevens for winning the best first novel Barry award for her first novel! I lost, but won another award at the same conference, so all was good. 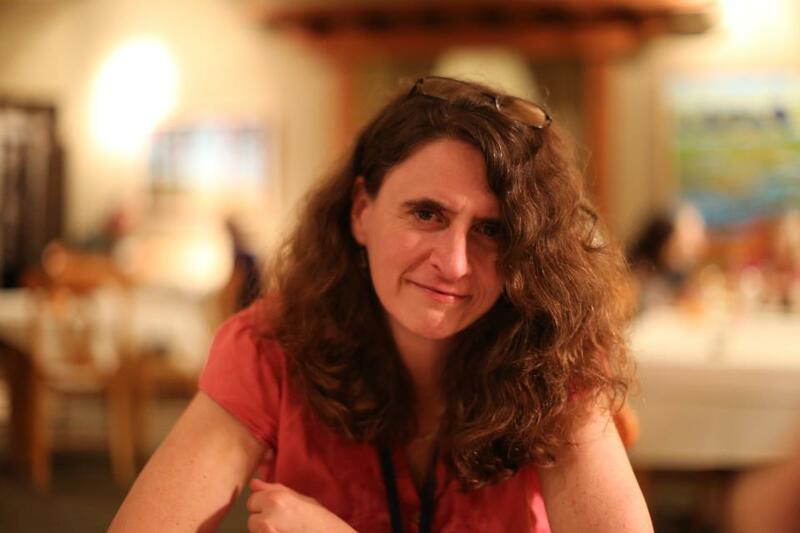 I also love this photo because it was taken by my good friend Christine McCann.